This article looks at subjective beliefs among sport coaches about effective communication in two different coaching contexts: During training and practice and during performance appraisals with their athletes. 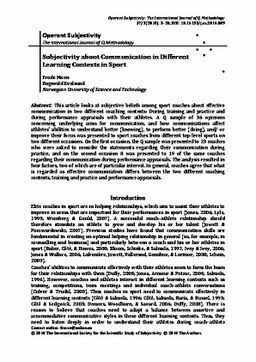 A Q sample of 36 opinions concerning underlying aims for communication, and how communications affect athletes’ abilities to understand better (knowing), to perform better (doing), and/ or improve their focus was presented to sport coaches from different top-level sports on two different occasions. On the first occasion, the Q sample was presented to 23 coaches who were asked to consider the statements regarding their communication during practice, and on the second occasion it was presented to 19 of the same coaches regarding their communication during performance appraisals. The analysis resulted in four factors, two of which are of particular interest. In general, coaches agree that what is regarded as effective communication differs between the two different coaching contexts, training and practice and performance appraisals.